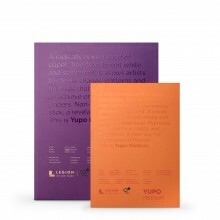 Pastelmat is a premium card surface (360gsm / 170lb) specially developed for pastelists. Its unique velvety surface, made from a fine coating of cellulose fibers, has the ability to grab and hold multiple layers of even the softest pastels. Pastelmat is ideal for use with all dry media - pastel sticks, PanPastel, pencils and charcoal. It is also water resistant which means that it can be used with wet media - such as acrylics and watercolor for washes and mixed media techniques. At Jackson's we stock the Pastelmat in 12 colours in large sheets (50x70cm) and in three sizes of pads in two groups of assorted colours.